This was the first of three consecutive medieval walled cities on the beautiful Dalmatian coast. 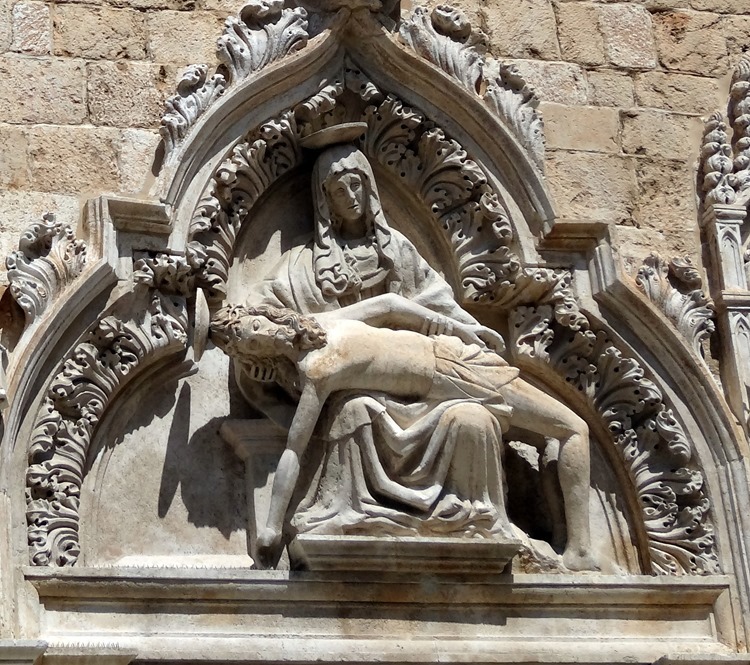 We arrived in Dubrovnik on April 20 and docked at the cruise port about 2 miles away, so we took a shuttle bus to the town (a few people walked it, but Mary still wasn’t feeling up to this). This city was originally an independent city-state called Ragusa. It was a successful merchant state and managed to retain its independence for many centuries through a combination of diplomacy, bribery, luck and even compromise (becoming an independent tributary of Venice and then the Ottoman Empire). Independence was an important value to the Ragusans, whose flag bore the inscription “Libertas” and who were the first state to formally recognize the United States after it declared its independence. However, in 1808 Ragusa made the mistake (similar to what we saw in Malta with the British) of inviting Napoleon in to save it from a lengthy siege by the Russians and Montenegrans. The French obliged, but stayed and incorporated Ragusa into the French Empire. The 1815 Congress of Vienna at the end of the Napoleonic wars made Ragusa a part of the Austrian Empire, then at the end of World War I it became part of the new country of Yugoslavia. It was at that time that the city was renamed Dubrovnik. Today, of course, it is part of the Republic of Croatia that emerged, after a particularly nasty war, from the breakup of Yugoslavia. I would be remiss if I didn’t mention that this war was settled in 1995 by the Dayton Accords, negotiated in my home town of Dayton, Ohio. The Dubrovnik we see today is a combination of old and new, the result of disasters that destroyed much of the city. The first was the earthquake of 1667 that killed about 5,000 citizens and leveled most of the public buildings (but not the walls). The other was the Balkan war of the 1990’s mentioned above that resulted from the death of Marshall Tito and the consequent breakup of Yugoslavia. You can see from the picture above that Dubrovnik is situated at the foot of a mountain & it was subject to brutal shelling during the war from Serbian guns. The city has been impressively restored, using the same materials & methods as originally, but the damage is still clearly visible in the large majority of the iconic orange roofs of the city that are new and bright, easily distinguishable from the duller and browner original roofs that remain. We entered through the PIle Gate (on the right in the picture at the top). Above the gate is a statue of St. Blaise, who has been the patron saint of Dubrovnik since the 10th Century when he was credited with saving the city from a Venetian attack. The gate is reached over a drawbridge that once spanned a moat. The stone bridge leading to the drawbridge was built in the 16th Century. The number one thing to do in Dubrovnik is to walk around the city walls, so that is what we did first. There is a small fee in money & a large expense in energy, since the walk is about a mile & a quarter and much of it is very steep. It feels like it is all uphill, but of course that is impossible outside of an Escher print. The walls are up to 80 feet high and up to 25 feet thick and there are several fortresses and towers built into them. They were built from the 12th to the 17th Centuries and have never been breached by a hostile army. The wall walk began, predictably, with a climb up a long & steep stairway, then one must walk counterclockwise around the city. The first landmark is the Fort of St. Lawrence, which is set on a rocky outcrop outside the city beyond a tiny bay with beautiful clear blue water. We continued along the seaward portion of the wall, from which there were grand views of the bay. On this part of the walk we passed an area of ruins from the 1667 earthquake with blue irises growing inside. We also walked above the back yards of some homes where people were living (not many people actually live within the old city any more). I would find it difficult to live where tourists look down into your yard all day every day. There was a shop on top of the wall selling embroidery and also cold drinks. And here (as everywhere) there were nice views of the city as well. Next we came to the old harbor, on the far left side of the first picture in this installment. It is too small for cruise ships, although some ships anchor nearby and tender their passengers to this port. It is bounded on one side by the Fort of St. John (at the far left in the first picture in this posting) and on the other by the Revelin Fortress. After the harbor, we turned the corner and climbed the steepest part of the wall (in the foreground in the first picture in this episode) toward the Minceta Tower, which is the highest point. The views from this part of the wall, looking down on the city roofs, were even better than before. The Minceta Tower is the highest & most prominent structure in the Old Town. We climbed to the very top & were rewarded with spectacular views of the city far below. I hope you are not tired of the orange roofs yet! Leaving the tower, we walked back down to the Pile Gate where we had entered the wall & descended into the city. This is a good place to take a closer look at the tiles on the roofs, and also to see some flora & fauna we saw from the wall. As you leave the stairway from the wall, just inside the Pile Gate is the little Church of St. Savior’, built after a 1520 earthquake & one of the few buildings to survive the 1667 earthquake. It is nestled next to the large Franciscan Monastery (now a museum) built in the 14th Century but mostly rebuilt after the 1667 earthquake, which has a nice cloister inside and a tower visible from most of the town. In the square in front of these buildings is the 15th Century Big Onofrio Fountain. Dubrovnik’s water came from the mountains on a 7 mile aqueduct that supplied this fountain, where townspeople drew their water, before continuing to other spots in the city. It once had a second story, lost in the 1667 earthquake and never restored. Stretching all the way across town from the Pile Gate to the clock tower in front of the harbor is the Stradun, the broad main avenue of this city of narrow streets. Dubrovnik was originally divided into two parts: a slavic town on the mainland and the city of Ragusa, built by leftover Romans, on an island barely off shore. In the 11th century the area between the island and the shore was filled in and the city became one. The Stradun is where the water used to be; it was paved in the 15th Century. This lively avenue is full of expensive shops and outdoor cafes (and, of course, tourists). 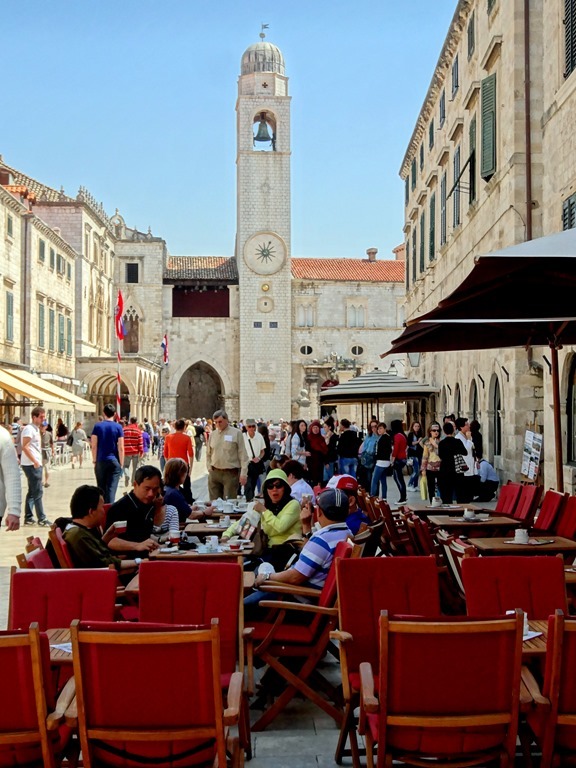 As you have seen above, at the harbor end of the Stradun is the clock tower, originally built in 1444 but rebuilt in the 1920’s because it was leaning. There is a clock at roof level & a digital time display in the two windows below. The bells in the tower are rung by two bronze figures, known as Maro & Baro. To the right of the clock tower is the city hall, then the Rector’s Palace, with another nice loggia. In the medieval city, the Rector was the head of government. Elected by the aristocracy, the rector’s term was limited to one month to ensure against an accumulation of power by any one person. The Small Fountain of Onofrio is next to the Guard House. Not too much further is the Cathedral. It was originally built in the 12th Century by, of all people, Richard the Lionheart of England in gratitude (to God, not Dubrovnik) for surviving a shipwreck on Lokrum Island, just off shore. Like so many old buildings in Dubrovnik, however, it was destroyed in the 1667 earthquake and the version seen today is an 18th Century reconstruction. It has a famous treasury containing several of St. Blaise’s body parts in addition to what is claimed to be a piece of the True Cross & even a piece of Jesus’s swaddling clothes (known locally as “Jesus’s nappies”). Unfortunately, you have to pay admission to see the Treasury, and we didn’t. I wonder what Jesus, who famously tried to throw the money lenders out of the Temple, would think about a church charging money to view his diapers (which is how they are labeled in English in the treasury). All of the almost 200 relics in the Treasury are in containers so you can’t really see them anyway. Overlooking another square nearby is the massive Jesuit Church, which can be seen from far away overlooking the city. The staircase leading up to it is said to have been modeled on the Spanish Steps in Rome. While waiting for Mary to peruse a couple of stores I happened upon this interesting building. It looks like a perfectly ordinary building, but on the side of it are posters showing it burning after being hit by a shell during the war. Its kind of chilling, but it also shows how well the city has been rebuilt to look as it did before the war. After exploring the city we decided to take the cable car to the top of Mt. Srd behind the city. The old cable car was destroyed during the war & the new one they built just opened in 2010. The station is a little way uphill from the city wall, so to get there we walked out the Ploce Gate on the land side of the harbor and across the stone bridge spanning what was once the moat. The view from the top was well worth the effort. At the top of the mountain is a fort built by Napoleon. During the Yugoslav war this fort held out against the Serbs with only a few dozen men inside, which was important because it commands what could have been a decisive position over the city. The fort still bears holes in its walls from shelling during the war. There are spectacular views up and down the coast from this spot., and behind it are the imposing mountain range that separate Croatia from Bosnia. Coming down from the mountain, the last thing we wanted to see before returning to the ship for some ice cream was the Sephardic synagogue. 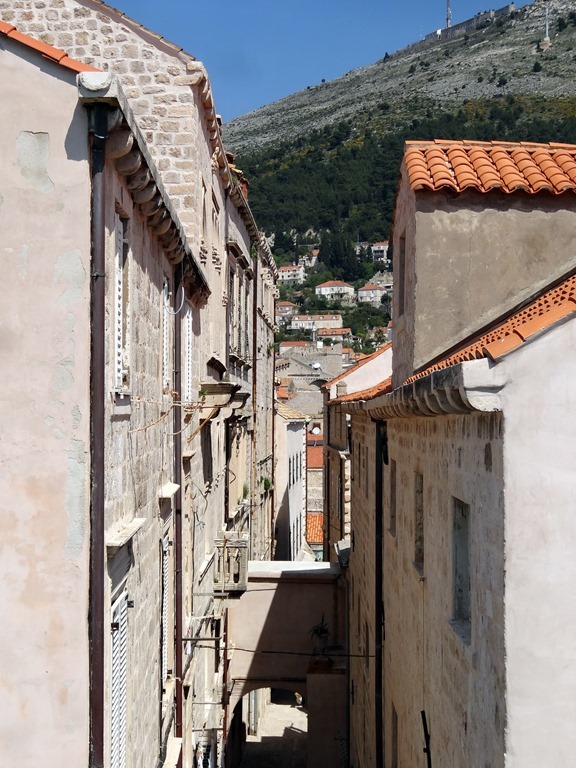 While there was a Jewish community here before, large numbers of Jews began passing through Dubrovnik on their way to Turkey after the Spanish expulsion in 1492 and a number of them settled here. A walled ghetto, locked at night from the outside, was established just inside the Ploce Gate in the middle 16th Century. Dubrovnik’s synagogue is the second oldest continuously functioning one in Europe (Prague’s is the oldest), although there are now only about a dozen Jewish families left (of 24,000 Jews in Croatia only about 4,000 survived the Nazis). Anyway, the synagogue is a small building that proved difficult to find among the narrow & steep (with stairs) streets of this part of Dubrovnik. Really, you wouldn’t know you were there until seeing the sign on the door. Inside is a museum & a shop selling interesting Judaica. Just a few random things before the end. First, this is as good a spot as any to mention that one of Croatia’s claims to fame (or infamy) is the invention of the necktie. The French word “cravat” is actually a corruption of “Croat.” They became fashionable in France when a group of Croatian mercenaries who were hired by the French king in the 17th Century sported them as part of their uniform. Second, I wanted to include a picture of one of the streets, which are really quite attractively made of fitted limestone (I think) blocks, with a trench built in for draining rainwater. Third, there was a group of young men who caused a bit of a stir marching down the Stradun carrying a Croatian flag and singing what sounded like a patriotic song. I don’t know if they were a nationalist group or just a bunch of guys unwinding after work. Then there was this little yellow bird I spotted on the top deck of the ship during the sea day between Athens and Dubrovnik. We were having a get together up there, and the whole time this bird kept walking back & forth across the deck. He must have unknowingly sailed with us from Athens, and he looked like he was thinking “Oh my God, what have I done? !” I hope he made it to Dubrovnik & was able to start a new life. So, as we set sail for Kotor, I will leave you with . . . towel animals! You may have seen these designs before; we did have a number of repeats (I imagine they don’t have 64 different towel animal designs). I hope to have the next installment up in less time than it took for this one, but I have discovered that there are so many distractions at home (washing dishes, doing laundry, gardening, seeing friends, driving to Minneapolis) that it seems to take a lot longer to finish them than it did on the ship. I will get it done eventually, though.